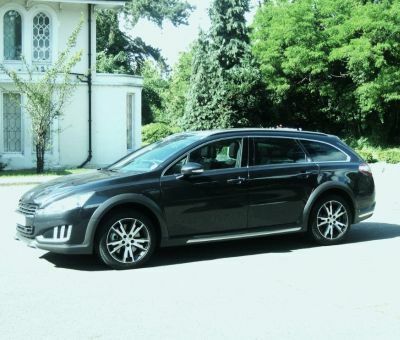 I have experienced a lot of cars that have given me a feel good factor, no more so than when I first encountered Peugeot’s executive class 508 saloon and Sport Wagon models, suggesting than that Peugeot had arrived in the premium class with this car. This subsequent encounter with a hybrid powered version finds me guilty of a great degree of smugness for this version proves that you can have your cake and eat it! Here is bags of refined performance produced in a refined manner from a fuel sipping power unit with a carbon footprint that gives the tax man a mere £20 after the first year’s use and, according to Peugeot achieved fuel costs of around £1,200 for 12,000 miles. Yes, this Peugeot is getting close to returning a four-figure mileage from one tank of fuel…surely a nightmare for Chancellor George Osborne? Of course, the price tag and the opulence of this big Peugeot, tested in the longer Sport Wagon variant, makes it a car for those with deeper pockets, many of whom doubtless achieved their financial well being by the Dickensian method of looking after the pennies. This hybrid powered model has been created by combining one of Peugeot’s excellent turbo diesel engines, in this case a 163 bhp 2.0-litre with a rear mounted 37 bhp electric motor, the set-up also involving a second generation stop+start system and energy harvesting as employed on current Grand Prix cars. A six speed selectable automatic gearbox is used that has an easy selection between Sport and Economy modes and also a switch selection to change to all wheel drive when the electric motor powers the rear wheels. This latter situation is really intended for tricky condition such as moving away on a slippery surface or that extra bit of grip on a loose track. The driving performance is rewarding, the road holding and ride is to the high standard demanded in this class, the steering response feels almost direct though the turning action is light, the brakes powerful with minimal muscle effort and the automatic transmission, despite a very slightly sticky manual action on the test car (probably due to newness), seamlessly compliant in automatic mode under all conditions. There is easy driving docility though the Peugeot ‘lion’ has plenty of bite when performance is necessary, Peugeot claiming a top- speed of 132 mph with 62 mph (100 kph) reached in 95 seconds. In practice it feels both lively and a refined mile-eating cruiser. Now for the ultimate smugness. The official fuel consumption figures are as follows: Urban 70.6 mpg - Extra-urban 67.3 mpg - Combined 68.9 mpg. Negotiate around the 60 mpg mark by fully optimising all the systems and that 15.8 gallon fuel tank should be getting close to 948 miles before visiting the pumps again. This is all exciting stuff but to make any headway in winning sales from the most discerning of owners the entire package has to be to an exceptionally high standard and I feel that Peugeot has effectively addressed the task building on that astounding performance with a stylish looking vehicle that is capacious but not clumsy, exceptionally comfortable for five adults and a mass of luggage and all wrapped in a quality product that is hard to criticise. For quality it really stacks up. There is plenty of the executive kit such as memory powered driver’s seat, a user friendly satellite navigation system, a head up display for both speed and route directions, self-folding mirrors when remote locked, heated front seats, SOS system, leather upholstery, a rear console with separate air conditioning controls, cruise control, and heated front seats etc. Peugeot has knocked on the door of the ‘big boys’ class on a number of occasions but with this remarkable car I think they have kicked the door wide open. Can you afford to ignore this one? MAIN RIVAL: Citroen DS5 Hybrid.